Alex Formenton got to a puck in the London Knights’ zone, got his stick underneath it and lifted it down the ice. Then he collapsed to his knees in utter exhaustion as the final seconds of the game ticked away. 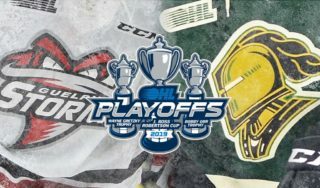 The play summed up just what it took to win Game 1 of the Western Conference semi-final series between the Knights and the Guelph Storm, which went to London by a score of 3-2. The Knights jumped ahead with a pair of first period goals and survived a Storm surge that twice brought Guelph back to within a goal in the game. Kevin Hancock’s power play goal in the second period stood up as the game winner as Hancock continued the ability he became know for as a member of the Owen Sound Attack in rising up to make plays in clutch situations. Both teams showed off all of the little things all night that coaches talk about in trying to win: blocked shots, solid checks, keeping feet moving and taking hits to make plays. London outshot the Storm 12-4 in the first period and 39-24 overall. Jordan Kooy recorded his sixth consecutive victory in net for the Knights, dating back to the final game of the regular season. Anthony Popovich suffered his first loss of the post-season in goal for Guelph. Knights goalie Joseph Raaymakers did not dress for the game because of the flu. Lucas Bain was called up to be London’s back-up goaltender. Hancock ended the game with a goal and an assist. A pair of Edmonton Oilers prospects had a pair of assists as Evan Bouchard of the Knights and Dmitri Samorukov of the Storm chipped in on the offense while playing solidly in their own zone as well. 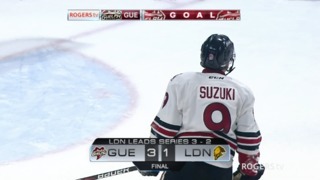 The teams play Game 2 in London on Sunday afternoon at 2 p.m. before the series shifts to Guelph for Game 3 on Monday and Game 4 on Wednesday. Liam Foudy of the London Knights opened the scoring in Game 1 with a sizzler of a shot from the right side of the Storm zone. London went ahead 2-0 when a penalty shot was awarded to Josh Nelson and he made good with a shot that beat Anthony Popovich. 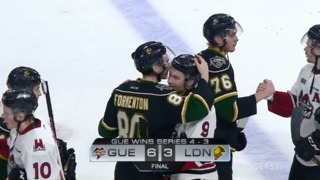 Guelph cut the lead in half on a power-play goal from Owen Lalonde at 4:50 of the second period, but London scored on a man advantage of their own at 10:18 as Kevin Hancock flipped in a rebound on an Evan Bouchard shot to put the Knights up 3-1 after 40 minutes. The Storm got to within a goal again in the third period as Londoner Isaac Ratcliffe found Mackenzie Entwhistle with a pass from behind the London net and Entwhistle made a move and scored and things sat 3-2 on the scoreboard the rest of the way. The London Knights had four members of their organization recognized as finalists for year-end awards. Evan Bouchard is up for Defenceman of the Year, Kevin Hancock for Overage Player of the Year, Joseph Raaymakers for Goaltender of the Year and Dale Hunter for Coach of the Year. The 2019 OHL Priority Selection will be held on Saturday, April 6. 980 CFPL will have a live draft show between 11 a.m. and 1 p.m. to recap the selections and talk with special guests. The Kingston Frontenacs own the first pick and have already confirmed that they will select Shane Wright of the Don Mills Flyers who was granted exceptional status by the Ontario Hockey League and will play in the OHL as a 15-year old. 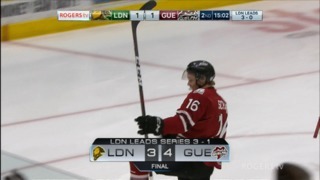 London and Guelph will play Game 2 on Sunday afternoon at 2 o’clock at Budweiser Gardens. Coverage will begin at 1:30 on 980 CFPL, at http://www.980cfpl.ca and on the Radioplayer Canada app.